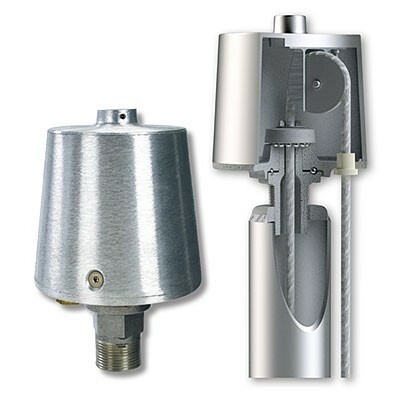 Includes seamless shaft of 6063 alloy with satin finish – cast aluminum revolving cone-style truck with pulley – braided polypropylene internal halyard – cam cleat accessible through locking door – two stainless steel swivel flagsnaps with covers – beaded retaining ring with counterweight – spun aluminum gold anodized ball – spun aluminum flash collar – galvanized steel ground sleeve with base plate and grounding spike. Easy Do-It-Your-Self installation. Kit comes complete with foundation sleeve, 16 gauge satin-finish aluminum pole sections, cast aluminum stationary truck with nylon pulley, gold anodized spun aluminum ball ornament, braided polypropylene halyard, cast aluminum cleat, nylon flag snaphooks and an American-made U.S. nylon flag with sewn stripes and embroidered stars, white canvas heading & two brass grommets. The 2-1/2 in diameter pole is 25 ft above ground & comes with a 4 ft x 6 ft U.S. flag. Shippable by UPS. 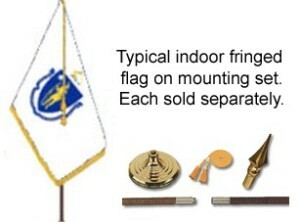 Add this “product” to your shopping cart and send ONE photo of your property to theflagfactory@aol.com , indicating the size(s) of flagpole you are considering. We will email you a separate photo for each size flagpole (limit 4). IMPORTANT: For us to properly scale the flagpole, your photo must include something of known size – such as a person – at the spot where you want the flagpole. The $ 25 (*) fee will be refunded if you buy a flagpole for $ 250 or more within 3 months of your photo order. (*) $ 19 + $ 6 “shipping” added at checkout. 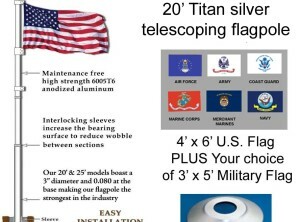 20′ Silver “Titan” telescoping aluminum flagpole with clear anodized finish + flash collar + 4′ x 6′ U.S. nylon flag + 3′ x 5′ military (*) nylon flag. IMPORTANT: Specify your choice of flag in “Comments” at checkout: Air Force, Army, Coast Guard, Marine Corps, Merchant Marines, Navy or POW / MIA. 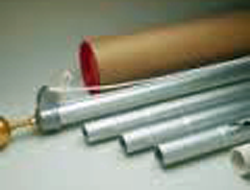 Flagpole sections are held in place by internal interlocking sleeves, engaged by twisting the section 1/4 turn. 3″ base diameter. Base section has 12-gage (0.080″) wall thickness; all other sections are 14 gage (0.065″). Includes rotating polycarbonate rings with stainless steel spring clips to hold up to two flags, 3″ diameter gold anodized spun aluminum ball, plastic ground sleeve. U.S. flag has sewn stripes and embroidered stars; military flags are digitally printed single/reverse on 200-denier nylon; all flags have white canvas heading and 2 brass grommets. Flagpole and flags are made in the USA. 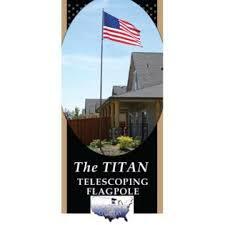 “Titan” telescoping aluminum flagpole with anodized finish. Sections held in place by internal interlocking sleeves, engaged by twisting the section 1/4 turn. 3 in base diameter. Base section has 12 gauge (0.080 in) wall thickness; all other sections are 14 gauge (0.065 in). Includes rotating polycarbonate rings with stainless steel spring clips to hold up to two flags, 3 in diameter gold anodized spun aluminum ball, plastic ground sleeve and 4 ft x 6 ft U.S. flag with sewn stripes and embroidered stars PLUS digitally printed 3 ft x 5 ft nylon flag of your choice. 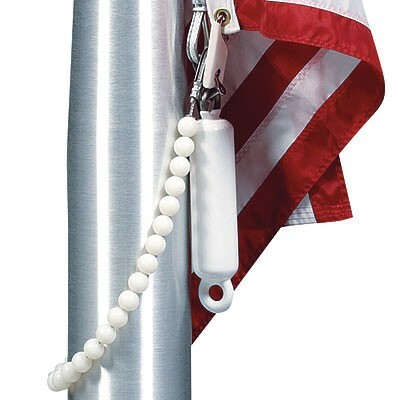 Flagpole and flags are made in the U.S.A.
Use menu below to select height (20 ft or 25 ft) and anodized finish (silver or dark/bronze/black). During checkout, indicate in “Comments” your choice of 3 ft x 5 ft digitally printed nylon flag from the following list. IMPORTANT: Indicate your choice of 3 ft x 5 ft flag in “Comments” when checking out. Non-rusting aluminum tire mount. 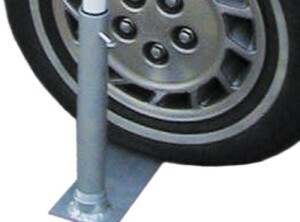 Place it under the wheel of your vehicle to hold a portable flagpole firmly in place. Mounting tube unscrews from the mounting plate for compact storage. 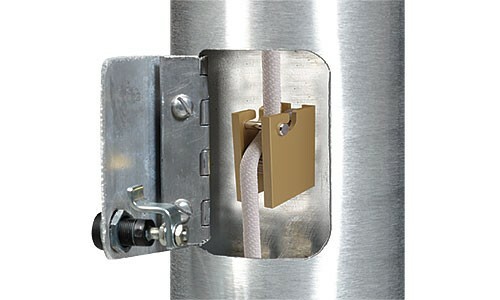 Use with any flagpole from 3/4 in to 1-3/8 in diameter. This mount is included in the Tailgater Flagpole Set. 20 ft Bronze “Titan” telescoping aluminum flagpole with bronze anodized finish (nearly black). Sections held in place by internal interlocking sleeves, engaged by twisting the section 1/4 turn. 3 in base diameter. 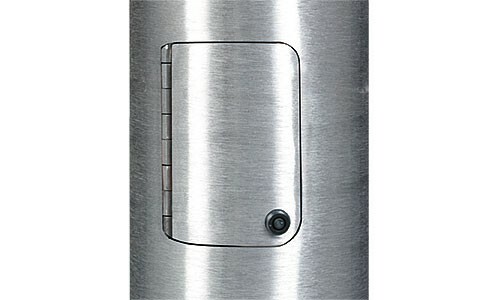 Base section has 12-gauge (0.080 in) wall thickness; all other sections are 14 gauge (0.065 in). Includes rotating polycarbonate rings with stainless steel spring clips to hold up to two flags, 3 in diameter gold anodized spun aluminum ball, plastic ground sleeve and 4 ft x 6 ft U.S. flag with sewn stripes and embroidered stars. Flagpole and flag are both made in the USA. 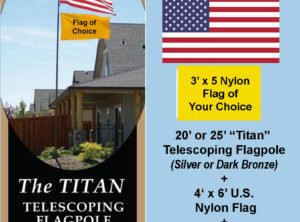 25 ft “Titan” telescoping aluminum flagpole with Bronze finish. Sections held in place by internal interlocking sleeves, engaged by twisting the section 1/4 turn. 3 in base diameter. Base section has 12-gauge (0.080 in) wall thickness; all other sections are 14 gauge (0.065 in). Includes rotating polycarbonate rings with stainless steel spring clips to hold up to two flags, 3 in diameter gold anodized spun aluminum ball, plastic ground sleeve and an extra-large 5 ft x 8 ft U.S. flag with sewn stripes and embroidered stars. Flagpole and flag are both made in the USA. The standard Titan flagpole kit comes with a 4 ft x 6 ft flag,and can accommodate a second 3 ft x 5 ft flag (total flag area = 39 square feet). A second flag should not be flown with a 5 ft x 8 ft flag, which by itself has an area of 40 square feet. NOTE: Flagpole with ground sleeve are shipped by UPS. Flag and ball are shipped by Priority Mail and may arrive at a different time than flagpole.